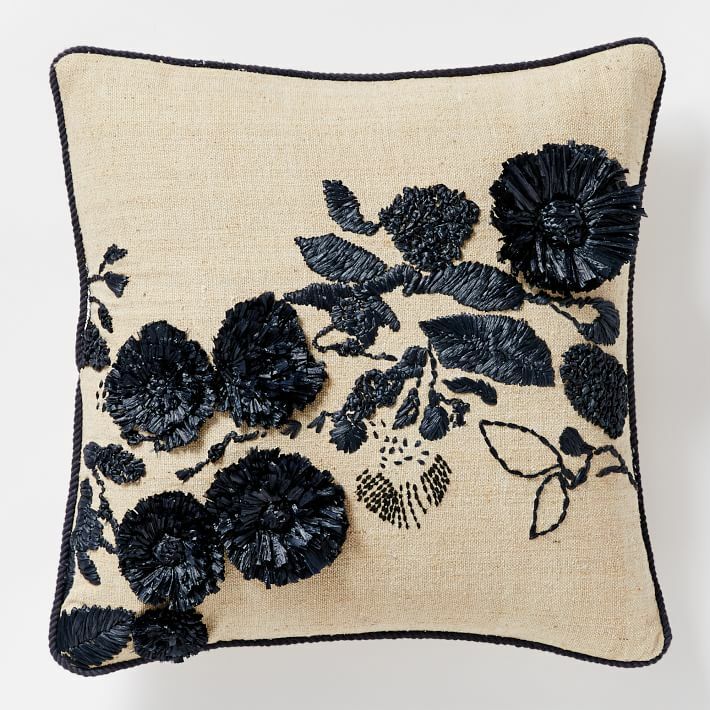 My very first décor love has always been with pillows. From DIY ink-jet pillows you print onto silk to felt appliqué pillows with a cheeky attitude, you’ll find one that suits your decor or mood. Pillows are one of the first things I learned how to sew, and they are the finishing touches I rely on to pull the entire look of a room together. 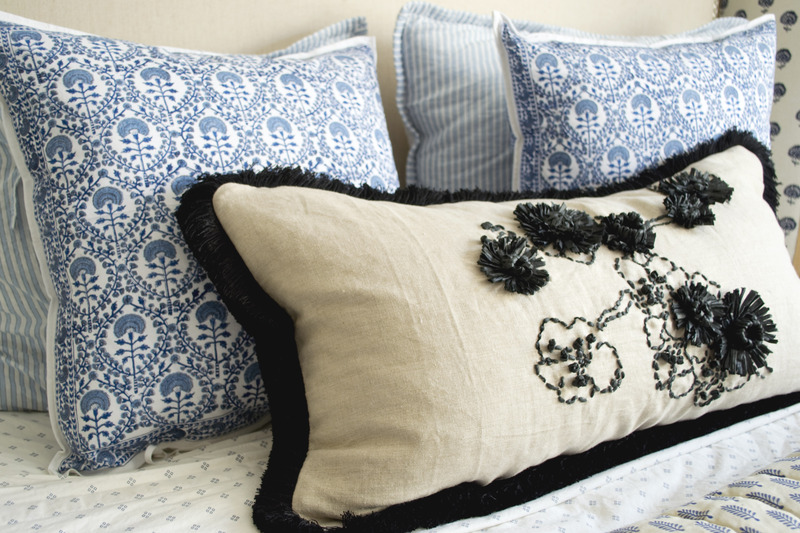 And in a small boxy space, pillows impart a sense of depth and softness to a compact boudoir. Use your 40% off coupon from Michaels and buy a plastic loom kit, which will help you make perfect raffia flowers in several sizes. Raffia comes in basic colors, and I chose black. The loom comes with an easy how-to sheet, but this flower loom tutorial video was very helpful. For the overall design, I drew a floral and vine pattern freehand on a piece of paper and used a light box to trace the pattern onto the linen. If you don’t have a light box, no worries. Go old school and tape the pattern onto a sunlit window and tape the fabric over the paper and trace. Experiment and try layering a smaller raffia flower on top of a larger one. Glue to attach flowers together. Next, with an embroidery needle, handstitch the outline of the flowers. 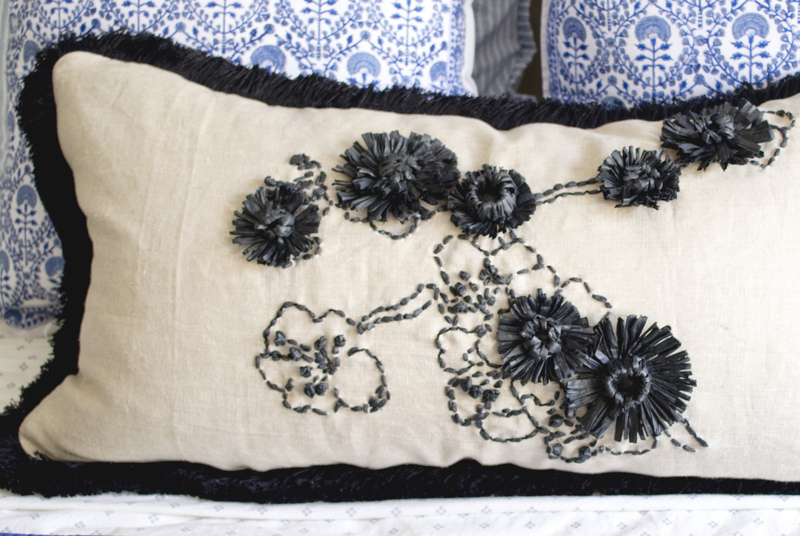 Glue or sew the woven raffia flowers to the front of the linen and voilà. You have a custom pillow no one else has. Onward to more small space decorating. More ideas coming your way!